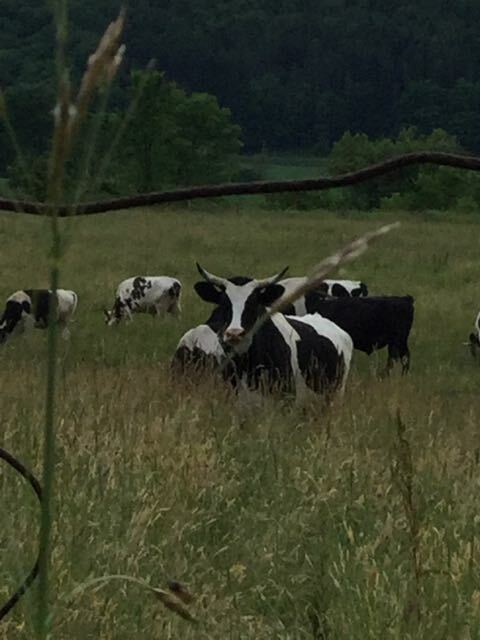 Last summer, on my walks, I often saw the cattle in a neighboring field. Sometimes they would run up to the fence as I walked past. One liked to lower his head and shake his horns at me threateningly. I tried to reassure him that I meant no harm. I was simply out for a walk. 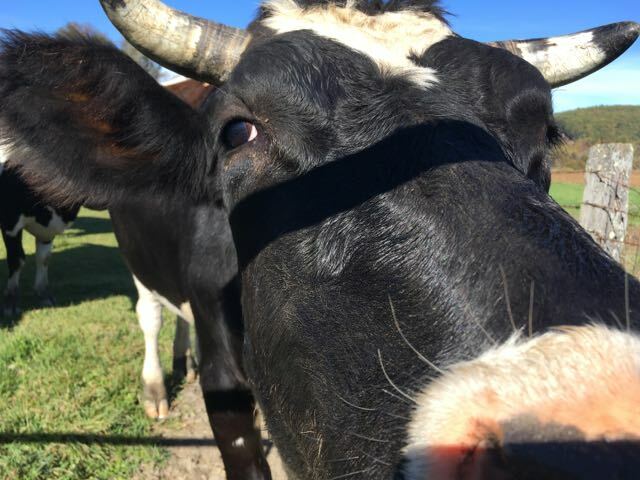 My bovine friends — or not-friends — became a fixture on these walks. I would scan the field to see where they were grazing. When one escaped, I tried to encourage him to go back with his compadres, but it’s hard to encourage an 1800 pound animal and keep a safe distance. One fall day, Bud was working in the barn across the street when he heard the screech of tires. He ran out to see a woman, wide-eyed, sitting in her stopped car in the middle of road, staring a herd of cattle thundering toward her up the road. They ran past the house, tipping the mailbox as they went and disappearing over the crest of the hill followed by men in pick-up trucks. That evening, when we went for a walk, we saw the guys in the pick-ups sitting outside the pasture that had once held their steer. “You weren’t herding them?” we both asked. “Hell, no,” the man replied. 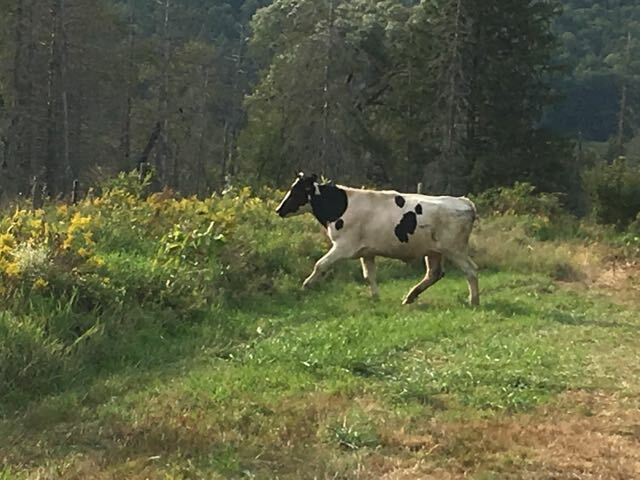 About a dozen steer were now on the wild in Otsego County, including the one who occasionally menaced. As best I know, they were never found — although I did hear of occasional steer-sightings. I pictured them when I read Lancelot Andrewes words. Breaking through the fence — wittingly and willingly. Almost exquisite — if one can use that word for cattle. By nature they seem quite curious and inquisitive. Insights on my favourite beasts! Thanks for sharing.